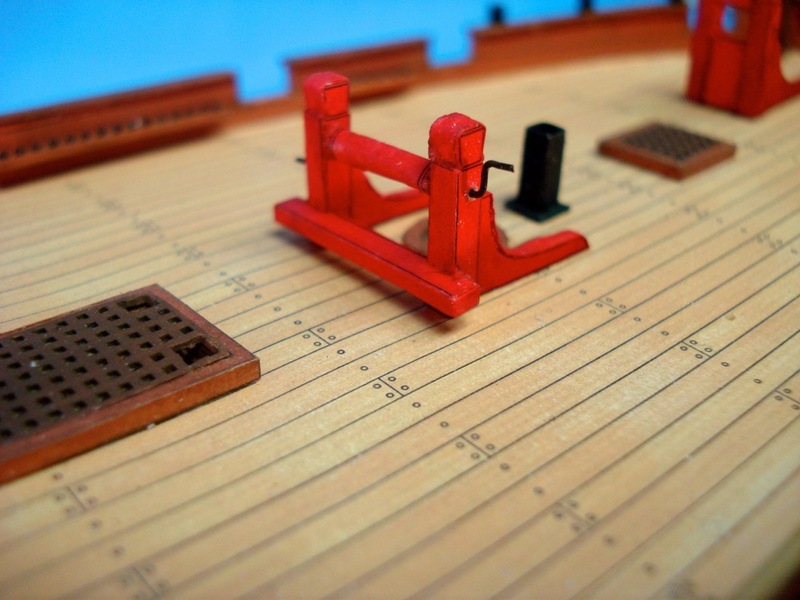 Building a 1/96-scale card model of the Naval Cutter HMS Alert, 1777 from a kit by ShipYard of Poland. Here it is, about a month after I said I should have the model done in about a week. HMS Alert, my first paper model project is finally done. I added the last of the rope coils last night and and working on the case. This is from the Shipyard line of kits from the Polish company called Vessel. The kits are sold in the U.S. by Ages of Sail (http://www.agesofsail.com). 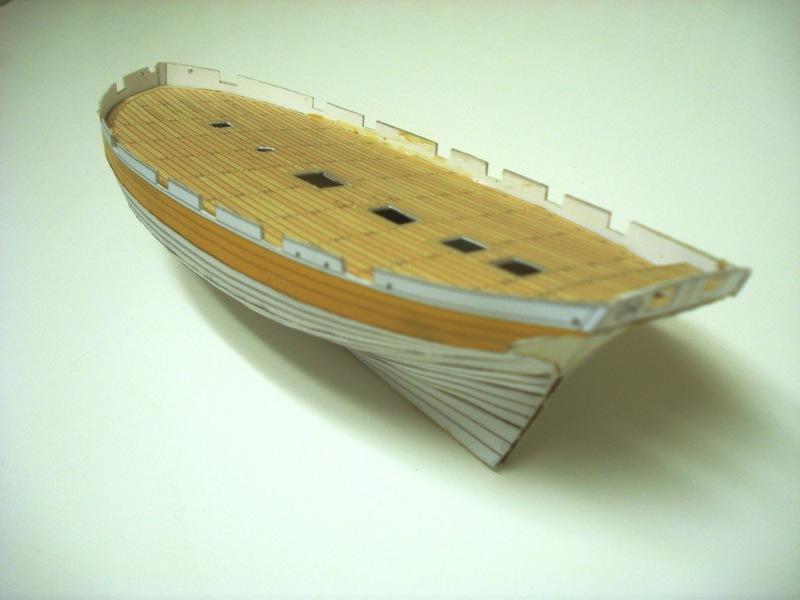 The hull and nearly all the deck details are cut from pre-printed paper parts provided in the kit. 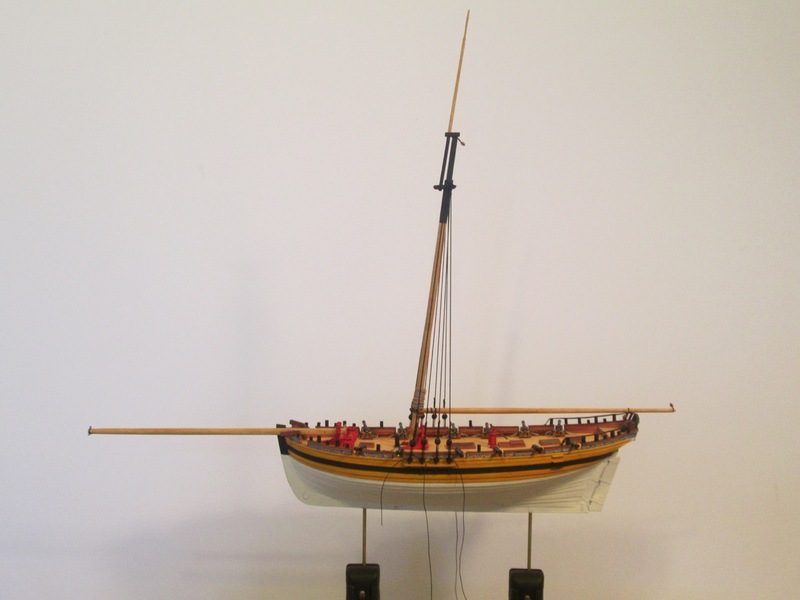 Some things, like the mast and spars and blocks are wood, purchased separately. 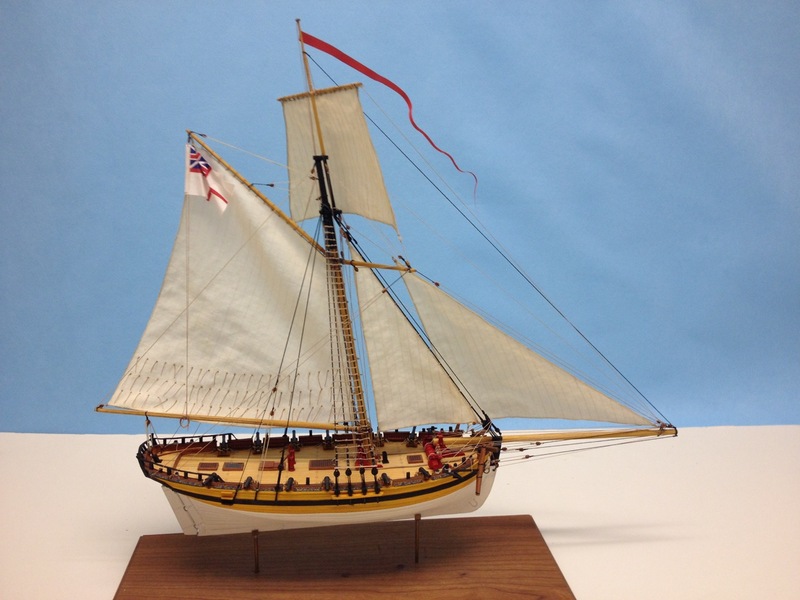 The sails are cloth, and the cannons are brass, sold by Syren Ship Model Company as small swivel guns. The blocks are swiss pear blocks that were also sold by Syren (sadly discontinued). Some other aftermarket parts were used, such as the gratings and the gun carriages, which I adapted from a detail kit sold by the Polish company GPM for a different model. Building this model was a real challenge in patience for me – there are a LOT of little parts to cut, and the instructions take a bit of study, like it’s in code. But overall, I had a blast building it. 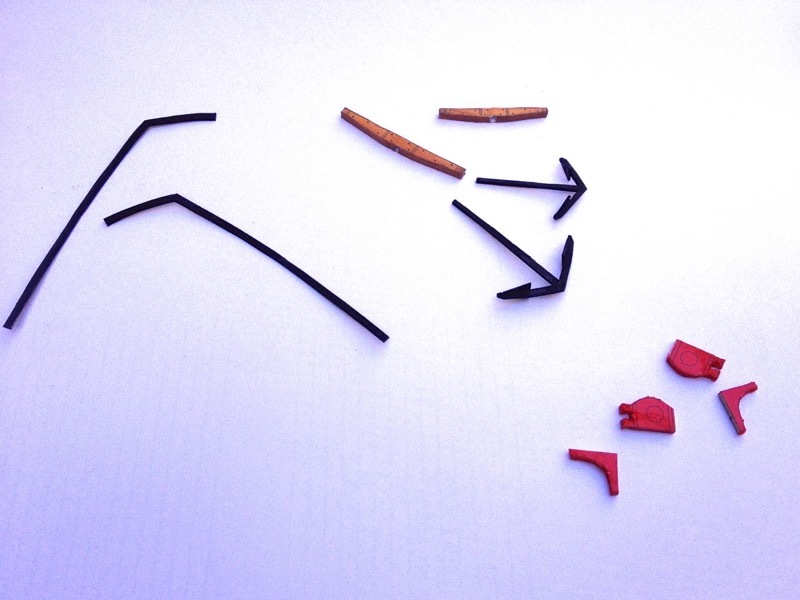 The kits are VERY inexpensive and if you photocopy the parts before you begin, you can usually recover from basic screw-ups – I certainly had a LOT of opportunity for that! I highly recommend trying a paper model kit. But not just any kit, I recommend one of the kits from Shipyard. 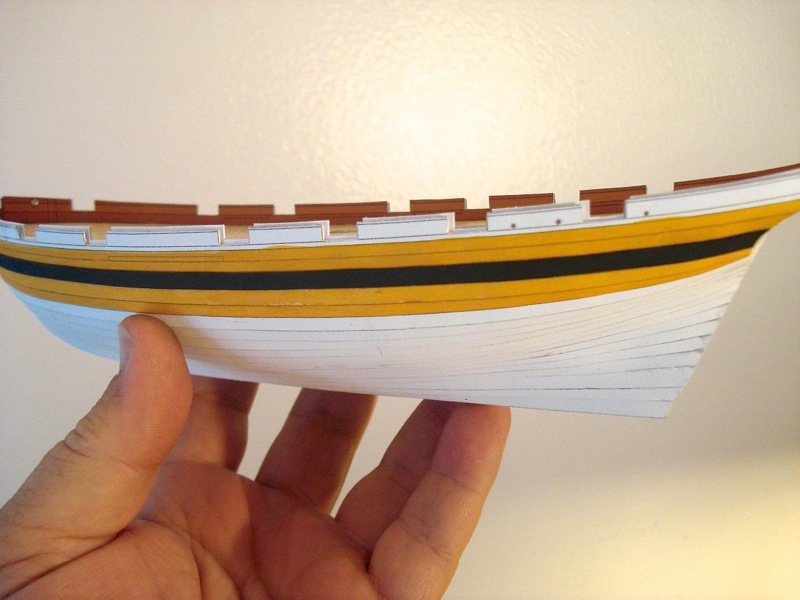 The models are constructed in a fashion that’s closer to wood ship modeling than is true for most other paper kits. 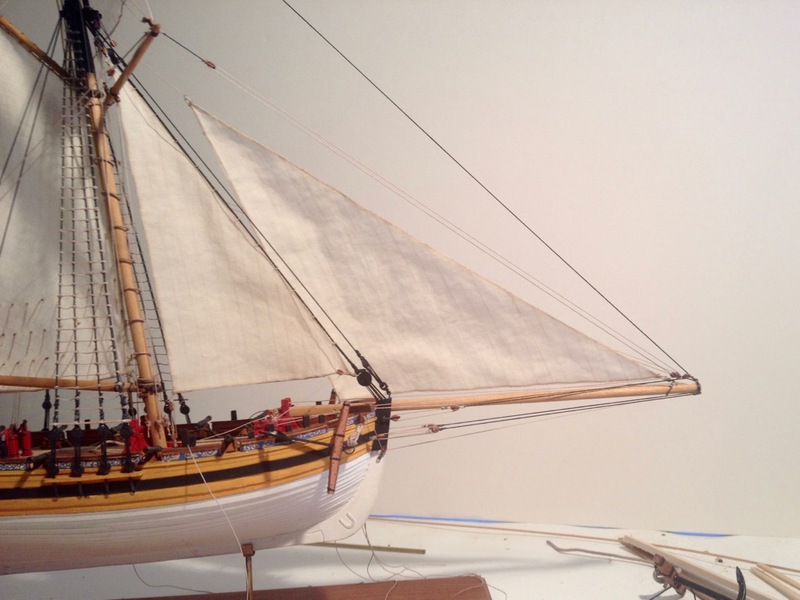 These kits are very high quality, but you just need to be aware that you will either have to make just about everything from paper provided in the kit, or you have to provide some of your own materials, like cloth for the sails, dowels for the masts, etc. If you have a bit more money than time, you should consider getting one of the boxed kits that is part of the Shipyard product line that used to be called Laser Cardboard Kits. These kits contain everything you need in one tidy package. Of course, it’s more money. Also, few part are pre-printed for you. 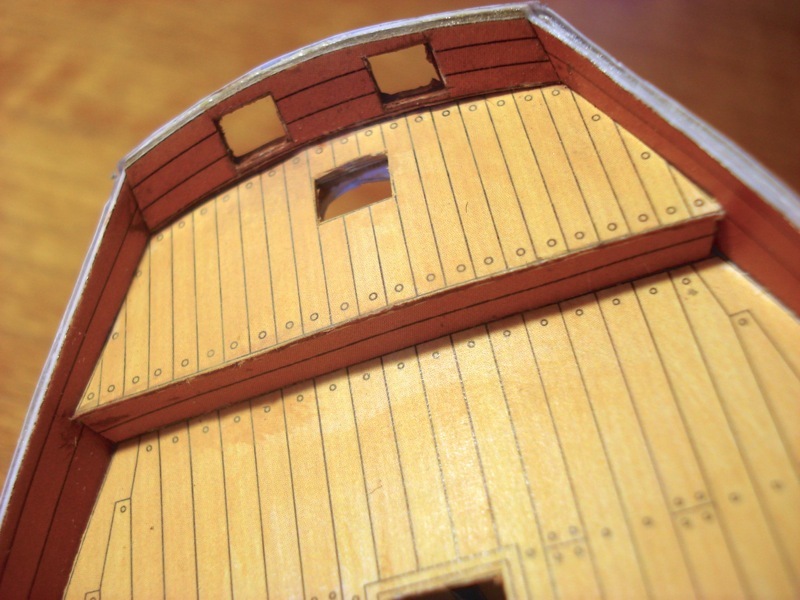 The big advantage is that ALL the parts are laser cut for you – a big time saver. Also, all the boxed ship kits are in a larger 1:72 scale, whereas all the paper ship kits are all 1:96 scale. This particular model is going to a good home with a fellow ship modeler who has been admiring it since I first brought it to a ship model meeting. He encouraged me to finish it up, and I will be transferring possession of it next week. In the meantime, I’m busy working on a case for the model. But, this isn’t the last you’ll see of HMS Alert. The new owner and I have made tentative arrangements for me to take it to the Nautical Research Guild conference in October. The model made its first debut at the conference in St. Louis, Missouri, in 2014, so it’s only fitting that it make an official appearance as a completed model in a case this Fall. This entry was posted in Card Models, HMS Alert - Card Model Build, Ship Model Build Logs, Ship Modeling News and tagged HMS Alert, Naval Cutter, Paper Models, Ship Model Kit, Shipyard on July 27, 2016 by catopower. I haven’t posted as often as I have in the past. Much of this has to do with the large number of issues and projects I’m dealing with at the moment. But also, I’m still working during the day, and for some reason this season has been oddly busy. Better that than oddly quiet I suppose, which it has also been at times. Also, I play Japanese folk music which has been demanding extra time this year. But, I’m sure you don’t want to read excuses, you want to know what’s new. 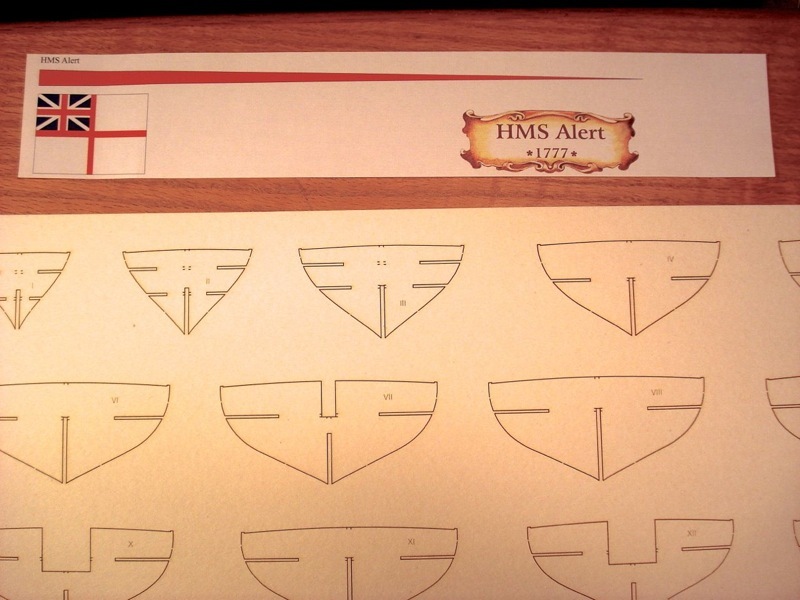 If you’ve been following my blog here, you are probably familiar with the paper model HMS Alert. The model inches ever so closer to completion! The biggest hold up on this model has been in dealing with the fashion trim at the stern and how it fits in with the boom crutches. While there are a couple images in the kit that show the boom crutches, it was not very clear what they attach to. These pieces are just simpl U-shapes with nothing to really to support them, except the taffrail. But it was difficult to find what was supposed to fit under the corner of the taffrail to support the crutches, let alone the weight of the boom cradled in them. This required some creative ship modeling. What I ended up with seems to work, but there’s no telling if it is what was intended by the kit designers. But, this isn’t particularly surprising for any ship modeler. Those of us who have built even one ship model are accustomed to this kind of problem solving. In addition to the boom crutches, there is a fashion piece that runs down the side of the hull right at the stern. Clearly, there is some error in my model’s construction, because the parts provided in the kit didn’t fit properly. Again, I had to adapt and make new pieces that looked correct that would fit properly in place. It took me a while to do it, though it wasn’t particularly difficult to make. Mostly, it was a matter sitting down and making it. Beyond these issues, I managed to finally mount the tiller, which is very thin and delicately attached to the rudder post. I also completed the bulk of the rigging, adding lifts, sheets and braces to the spreader yard. I still have to tie off a few things, but the trickiest parts are done. Next are the braces for the topsail yard and the addition of flag and pennant. Also, I have yet to rig the jib sheets. But, that’s not too much left to do, so I’m hoping to be done by next weekend. Part of the project is also to build a case for it, but as for the model itself, the end is near! I’ll post next when all is done. This entry was posted in HMS Alert - Card Model Build, Ship Model Build Logs, Ship Modeling News and tagged Naval Cutter, Paper Models, Rigging, Shipyard on June 25, 2016 by catopower. I haven’t posted an update on this project for a several months, so figured it was time. I now have someone who wants the completed model, so that pushed this project up in priority. 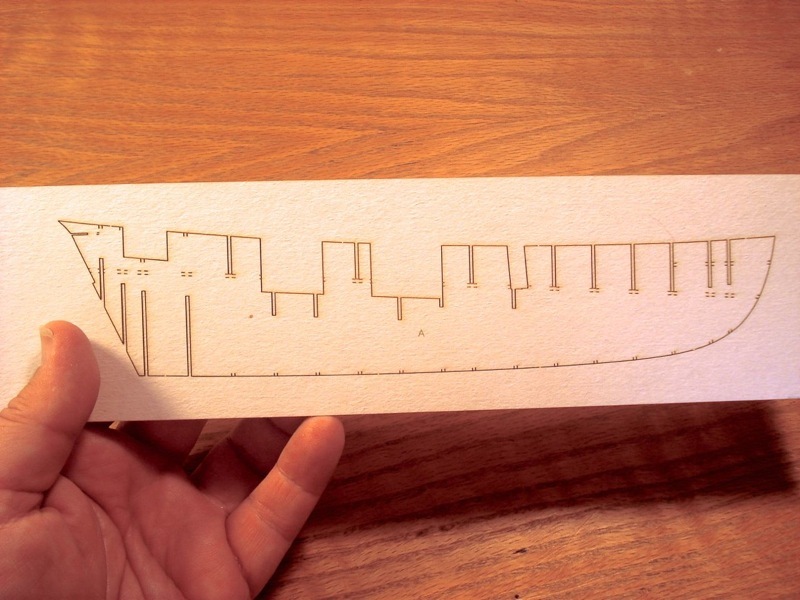 Initially, it was more of a test to see what building in paper was like. But, it was so much fun that I kept going with it. Now, it’s close enough to completion to really push to finish it. 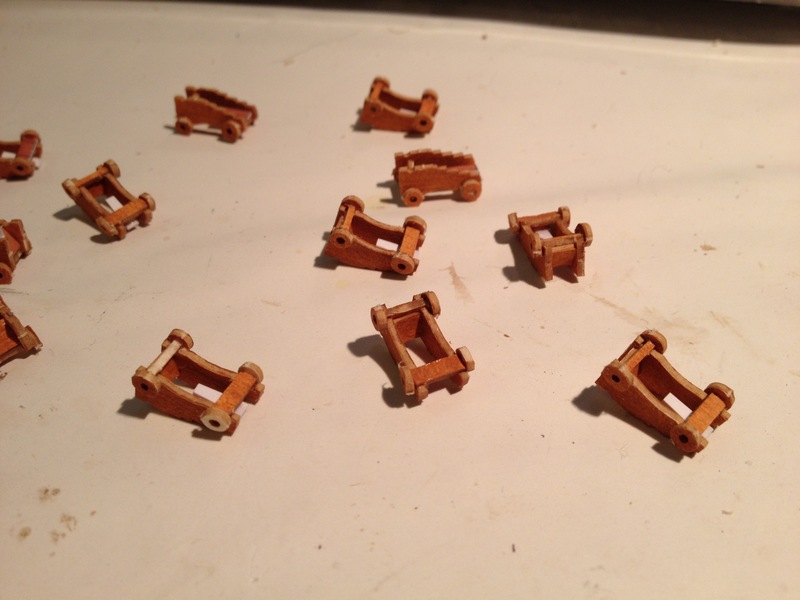 I finished building the carriage guns, blackening them and adding breech ropes. For the ropes, I ended up using Morope brand model rope. The main reason for using Morope was simply to test out the product. This model rope certainly looks good, but it does want to unravel quite easily. I found it best to put a drop of CA glue at the point where I want to cut the line. After the CA dries, I cut the line and there’s no unravelling. The other model rope I was considering was the stuff sold by Syren Ship Model Company. Initially, I avoided this rigging line because for most purposes, the lay of the rope is backwards. It’s all left-hand or S-laid rope. I’ve since changed my mind about the Syren model rope because it’s so nice to work with. It’s stiff, but flexible, doesn’t unravel, and looks great. However, since I already started using Morope, I figured I’d continue with it. Not so clear photo of the finished cannon on carriage with Morope breeching rope. For the cannons, I ended up using turned brass barrels sold by Syren Ship Model Company as swivel guns. 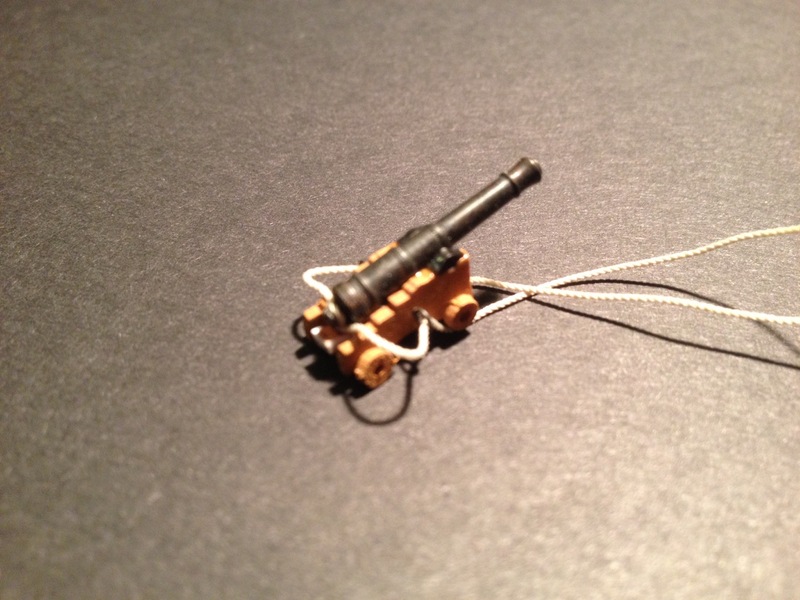 One of the sizes worked out perfectly for this models small carriage guns. Making the carriages was the hard part. But, there’s only a dozen to get through. I then had to add eyebolts at the ends of the breech ropes and drill the bulwarks to mount them. The deck is open and so drilling and adding the eyebolts into place wasn’t too bad. But, the model is more delicate than a wooden one, so it required extra care. HMS Alert in my shipyard with Colonial Schooner in background. All cannons are in place and rigged with breech ropes. As you can see, the taffrail is pretty well complete. That’s one feature that really made me sweat. Getting those stanchions all in place and then adding the rail and trying to make it run as flat as possible… I’d put off building the rail for a while until I could muster enough nerve to deal with it. Since then, it’s been mostly smooth sailing. I worked on the sails some time ago. They’re are cloth and purchased as a separate accessory set available from Shipyard. They are pre-printed, but only on one side. 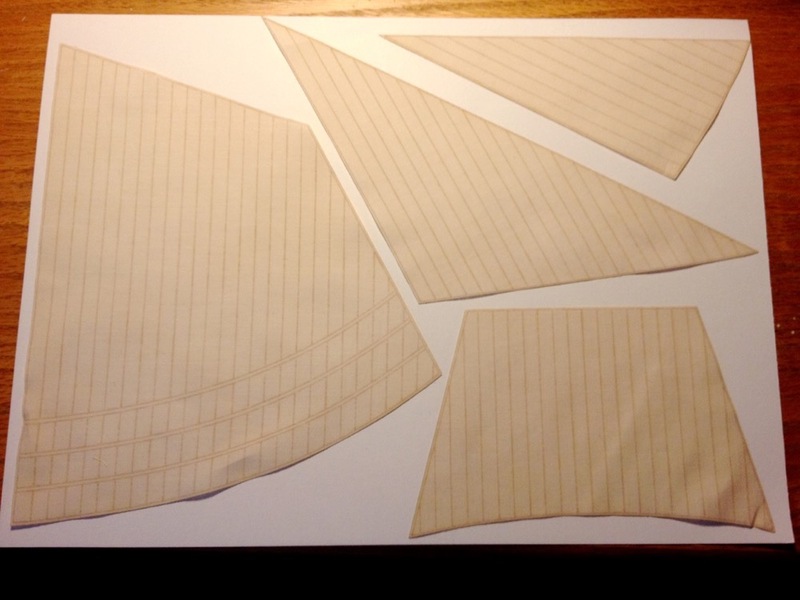 Getting the lines of the cloth to show through required lightly tracing them onto the blank side in pencil. Bolt ropes were glued around the edges using simple white glue. I also added all the small ropes to the two reefing bands on the mainsail. I’d purchased the masting set from Shipyard too. 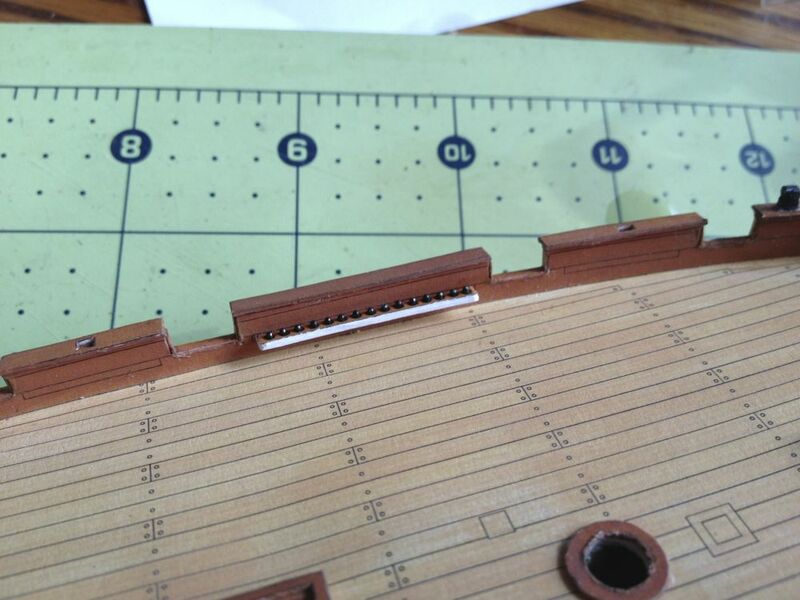 This just consists of some dowels and a few laser cut cardboard pieces for the cross trees, mast cap, etc. For blocks, I decided to use some swiss pear blocks I bought from Syren Ship Model Company. They stopped making them rather abruptly and did a big sell-off before I’d had a chance to stock up on more of the sizes I needed. But, this model doesn’t use too many, so I figured I’d go ahead and use them. Anyway, they’re really nice looking blocks. I made up a batch of paper blocks, but I figured I’d use the swiss pear ones while I had them. Finally, I began the process of rigging by adding the lower deadeyes into place, and rigging the shrouds. As you can see the main boom is also in place. I had to finish up all the details on it first, then decided I’d better add it before too much other rigging gets in the way. I have to now add all the blocks I’ll need on the mast, gaff and yards and sails. Then, I’m going to have to tie the backstays around the mast head so I can finish up adding the main and preventer stays which will lead down to the top of the stem. Really starting to feel like I’m getting into the home stretch on this model. One interesting thing I’ve discovered is that the deadeyes are really pretty securely attached on this paper model. That was one thing I had concerns about. But, I wire stropped them and then simply bent the bottom of the wire to insert into holes I drilled into the hull, forming the chainplate. A faux chainplate is then glued to the face of the wire. This entry was posted in Card Models, HMS Alert - Card Model Build, Ship Model Build Logs, Ship Modeling News and tagged Card Model, Naval Cutter, Paper Model, Ship Model Kit, Shipyard on March 17, 2016 by catopower. With other projects requiring completion, I haven’t had much time to work on this model. But, I did finish some of the deck furniture and I also managed to get the gun carriages together. I’ve played around with rolling the cannon barrels from the paper patterns included in the kit, but having been ship modeling for so long, I’m having a hard time bringing myself to using them since I don’t think my barrels are looking very good. Certainly, there are experienced paper modelers that can do an amazing job on them. I’m not one of them. So, I’ve been exploring alternatives. I could try turning my own, but I managed to find some cannon barrels that look good and seem to be a pretty good scale fit. 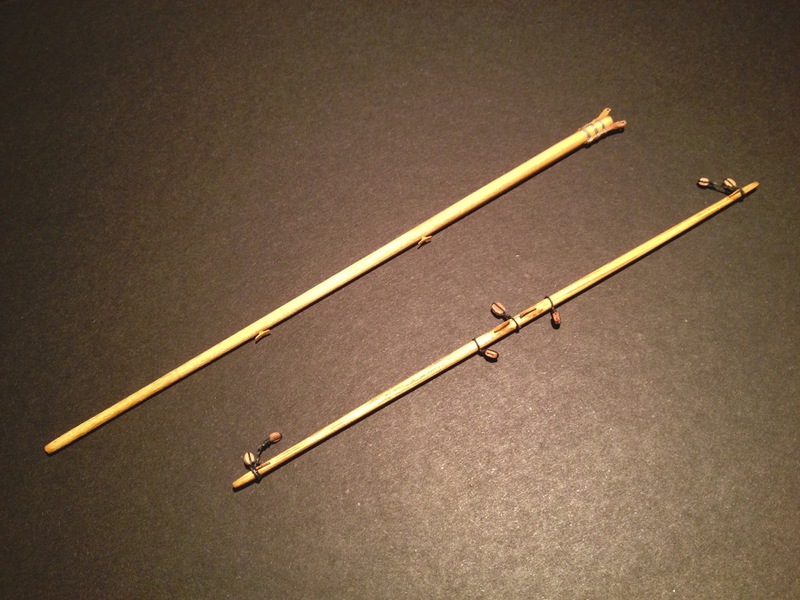 The barrels are actually 1/4″ scale swivel gun barrels sold by Syren Ship Model Company. I had some on hand for another project and set one onto one of my gun carriages and it makes for a pretty good fit! The barrels aren’t cheap at $11.50 for a pack of 4 and I need a total of 12, so that’s close to $40 after shipping. Still, they look very nice, they’re the right scale, and I won’t have to then make them! Now for the Alert’s swivel guns, there is nothing I could find that’s commercially available and small enough for the job. So, I may just ignore the swivels on this model. 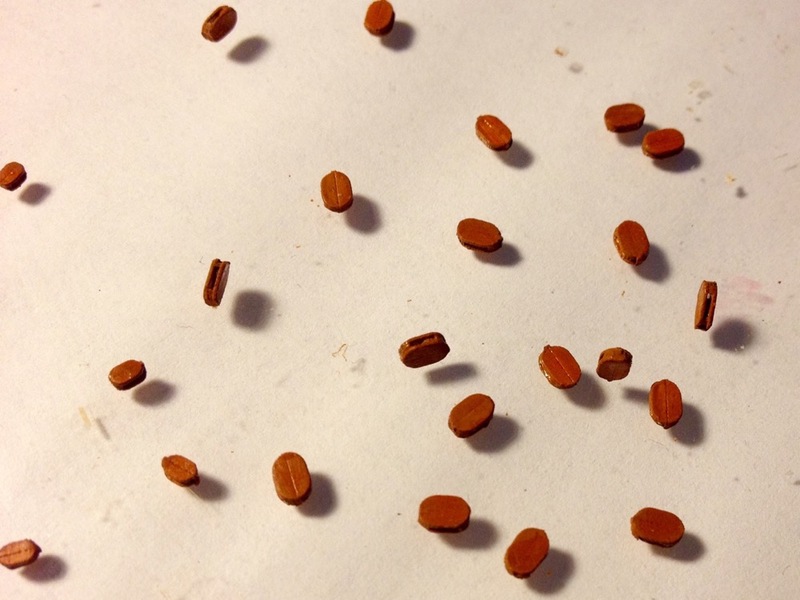 Otherwise, I could try to turn some, but they’ll be so small, I’ll probably end up ignoring a lot of the finer details. Anyway, the barrels will end up blackened and they’re small enough that details won’t be that noticeable. A Syren Ship Model Company 1/48-scale swivel gun barrel filling in for my 1/96-scale 6pdr gun – A good fit on the carriages I made. Now, since I was working on some kit details anyway, I started looking at the sails, masting and rigging. 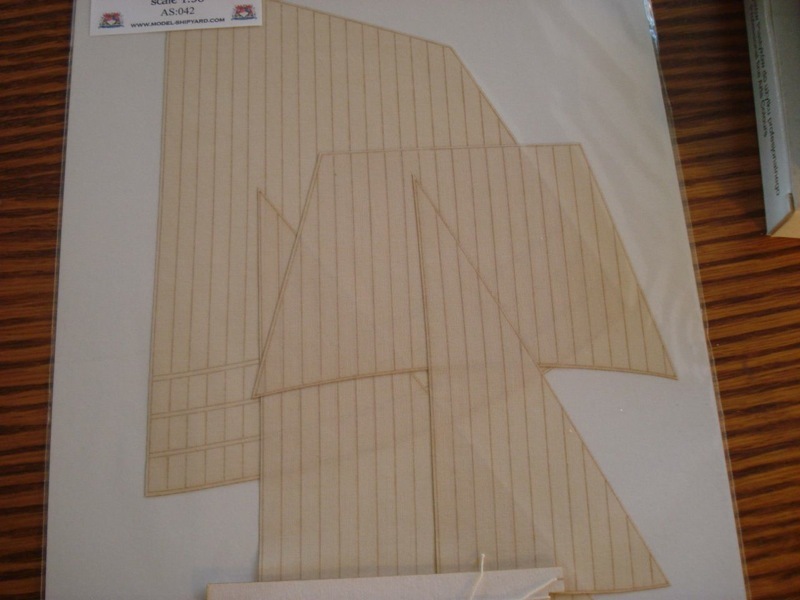 I purchased the set of sails sold by Shipyard. They are nicely laser cut and printed on one side, but only on one side. Now, if I were going to sew them, the lines would be perfect guides. 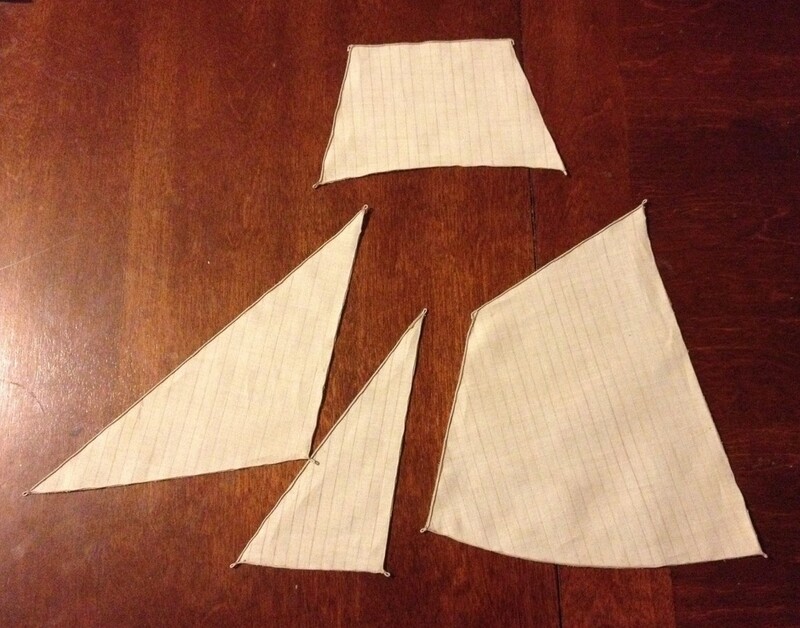 But, since I’m not planning on sewing, there’s a problem of having no detail on the back side of the sails. There are two ways to fix this as I look at them. The first is to trace the lines onto the opposite side of the sail, so the backs aren’t so empty looking. 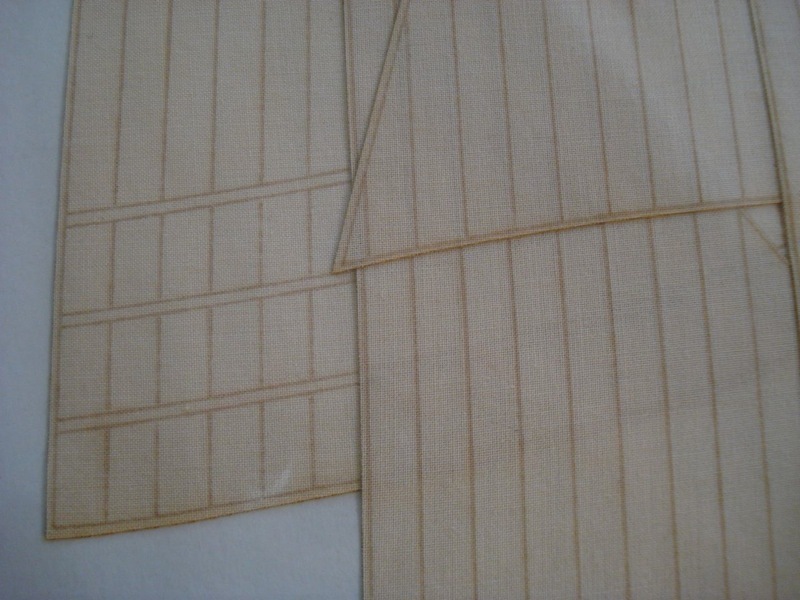 The second is to make new sails, probably from paper or silkspan. But, at this point, since I already have the sails, I’ll try tracing the lines onto the back and see how that turns out. The last item on my list are the blocks. I made the boom, gaff, masts, bowsprit, and I’m close to the point where I’m going to have to start rigging blocks onto them. I worked out the sizes I basically need and they’re 2mm through 3.5mm. 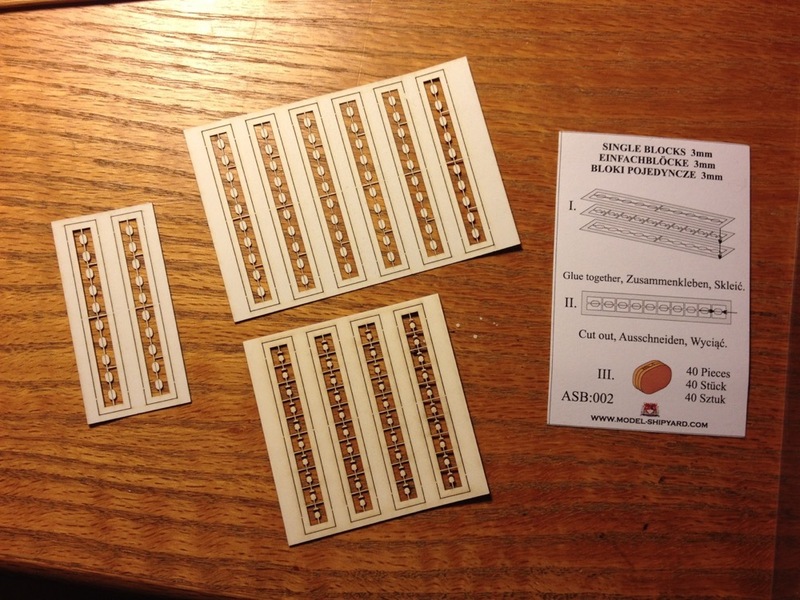 Actually, the block patterns included in the kit are 2.5mm, 3mm and 3.5mm, and I purchased the Alert’s blocks set from Shipyard too. This is what you get in a 3mm single sheave block package from Shipyard. These are enough parts for 40 blocks. The question on whether to use these or wooden ones all comes down to how nicely I can make them look. 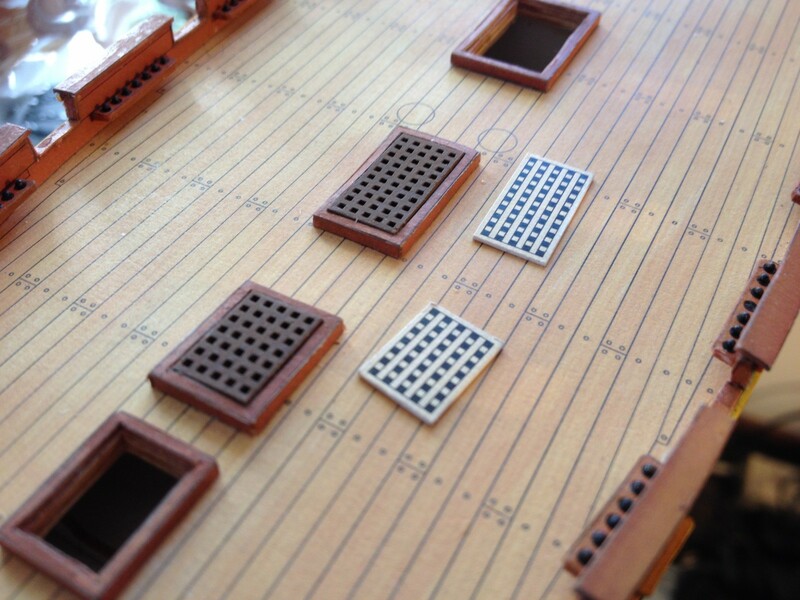 Syren Ship Model Company sells some beautiful pear wood blocks available in 2mm, 2.5mm, 3mm and 4mm sizes. Problem I have with them is that they don’t have 3.5mm blocks, and I find the visual jump from 3mm to 4mm too significant on a small scale model. 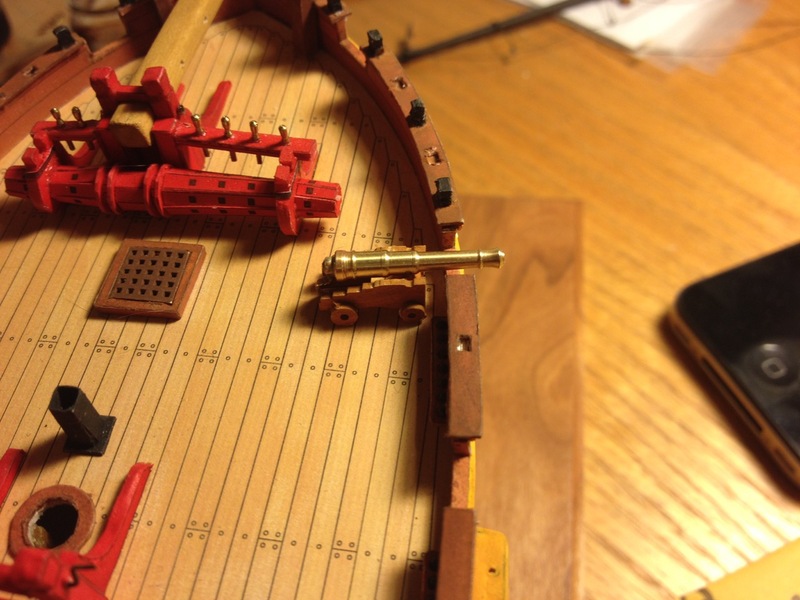 i actually had a problem rigging the cannons on my colonial schooner model because I was using Syren’s pear wood blocks and the 3mm size was too small for the guns and 4mm was way too big. What I did there was to use another company’s 3.5mm blocks in that one place. But, for this model, I’m going to see if I can make the paper blocks work. I spent some time last weekend making the needed blocks, gluing them, trimming them apart, painting them, etc. Though they’re designed with the proper sheave holes, I’m going to drill them out to make it easy to rig them. That will be the test as to whether they’re sturdy enough for me to work with. Separating the assembled and painted blocks. The final blocks ready to drill out and test. I now have enough of all sizes for the model. I really should have 2mm blocks as well, but that’s awfully small to make, I’d have to order more from Poland, and the smallest that the kit instructions call for is 2.5mm. So, I suppose I can live with that. Anyway, I’ll see how well the drilling out of the blocks goes and we’ll find out if I end up using these or switching to wooden ones. 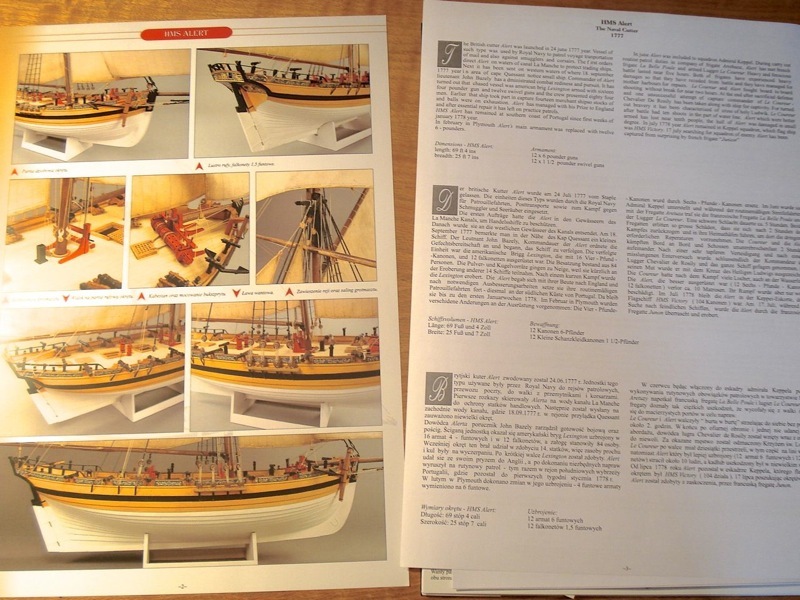 This entry was posted in HMS Alert - Card Model Build, Ship Model Build Logs, Ship Modeling News and tagged HMS Alert, Paper Model, Ship Model Kit, Shipyard, Swivel Guns on September 2, 2015 by catopower. 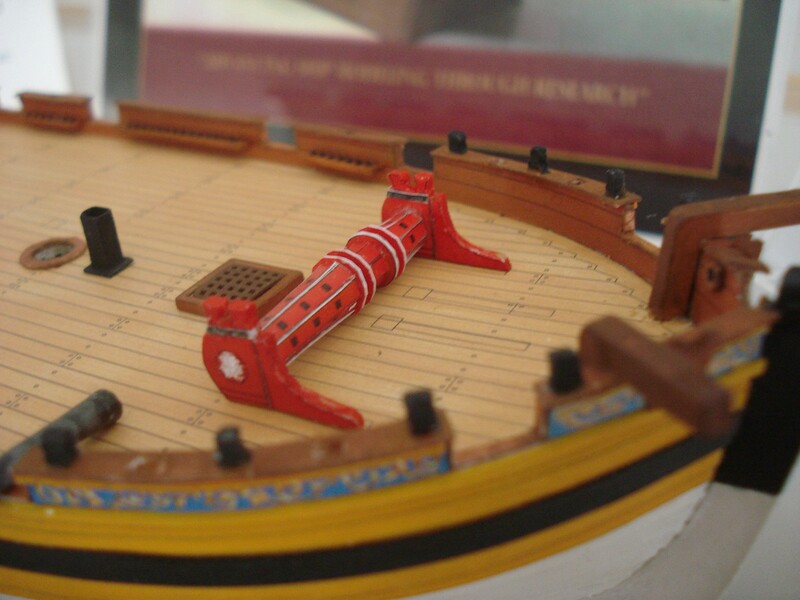 Several months ago, I acquired Shipyard’s HMS Mercury 1/96-scale paper model kit. I had to check it out as part of my research into the hobby and also because I just couldn’t help myself. 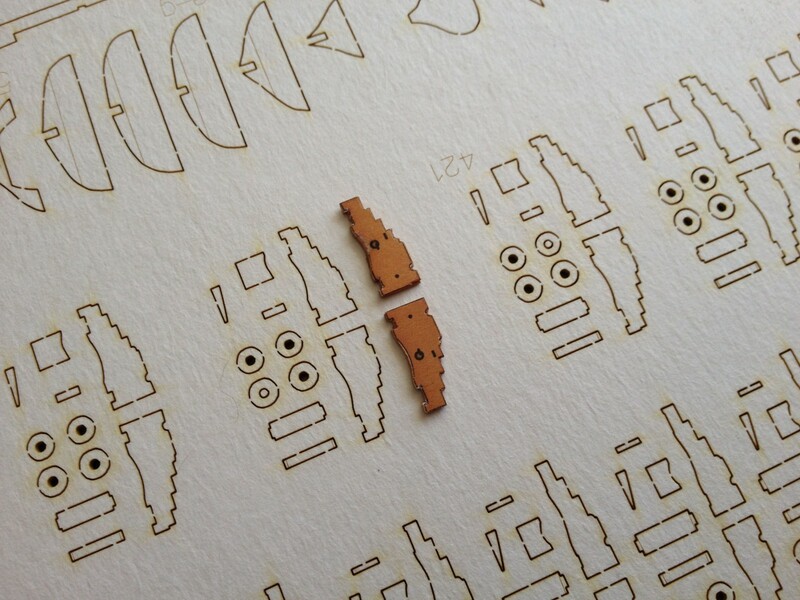 In addition, I bought a matching laser cut detail set from GPM. 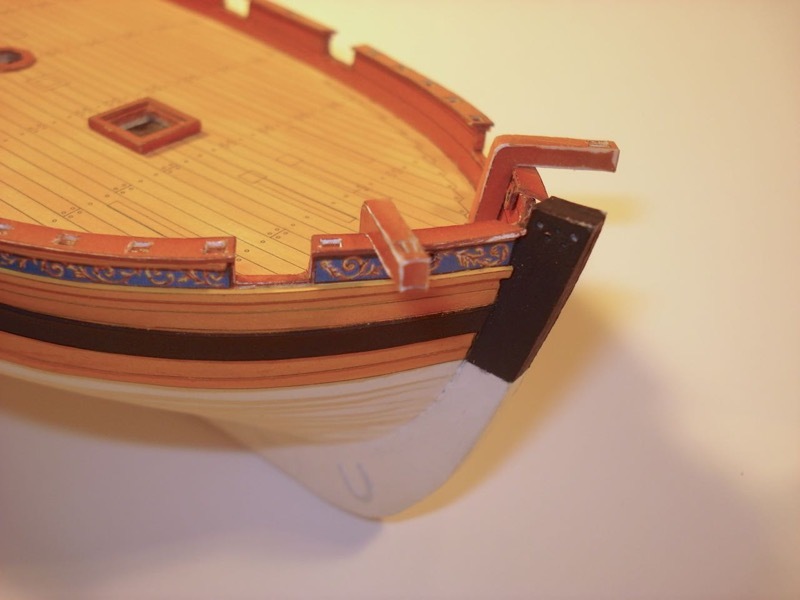 The basic kit includes the laser cut frames, but the detail set includes some very nice features like the gratings, parts for the ship’s boats, cleats, blocks and deadeyes, cannon and carronade carriages, and especially nice are the laser cut parts for the stern and quarter galleries. I just couldn’t imaging using the printed windows or trying to cut out the frames. 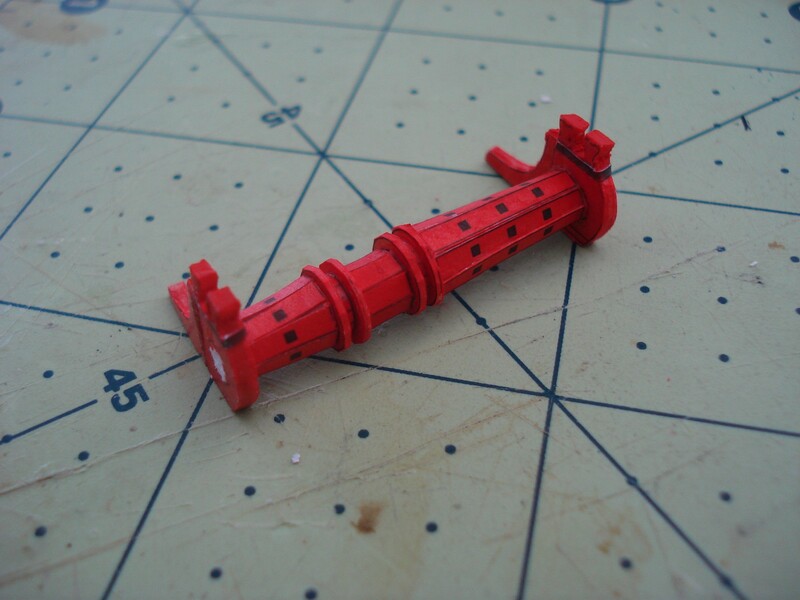 I got an idea and looked over the 1/96-scale HMS Mercury detail set and discovered that several items in that set are compatibly with the Alert. Maybe that’s saying that the kits aren’t to precise scale. Nevertheless, the detail kit for the Mercury cost me about $35 shipped from Poland, and I’m quite willing to sacrifice it for the good of the cause. Turns out that the quarter deck cannon carriages are a perfect match for the Alerts carriages (and the right quantity), the gratings look like I’ll be able to cut them to size, some of the cleats are perfect match and there are some others that I think I can trim quite easily. Also, while I’ve already acquired laser cut blocks and deadeyes of the right size, the Mercury detail set has a ton of these and enough of the smaller ones are the right size to use for the Alert. Anyway, the point here being that if you want to make your life easier with this kit (and probably others too), get one of the detail sets from GPM. It’s definitely going to give my project a boost. First thing I did was to replace the printed hatch gratings with the laser cut ones. They actually turned out to be a pretty close fit, needing only minor trimming. Once painted I put them in place and you can see them in place here with the printed ones next to them. 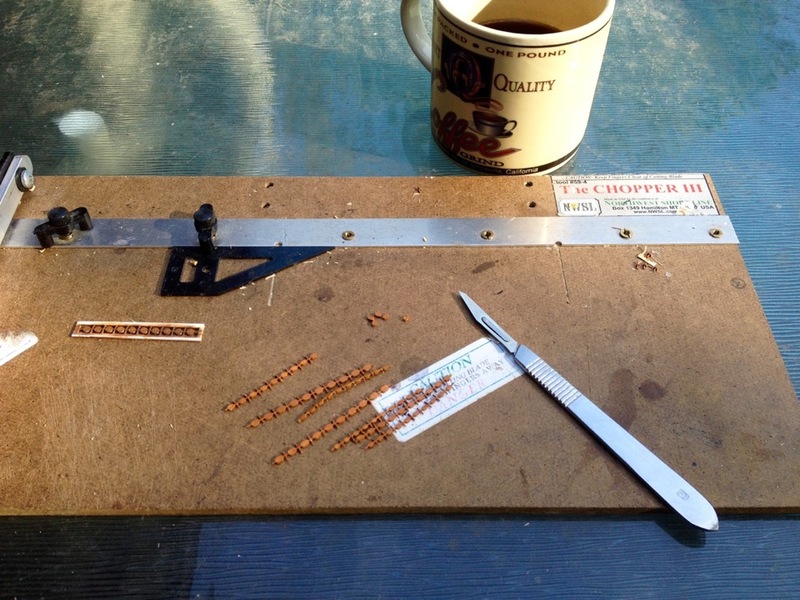 Now, getting back to the kit parts, I was on a roll and decided to make a simple sliding type hatch cover for the wardroom companionway. At 1/96 it doesn’t have to be that sophisticated. Needed planking, so I printed out 0.25pt lines 1/16″ apart. I’m using Adobe Illustrator for a number of other tasks, so it was easy enough to fire it up and make the pattern. 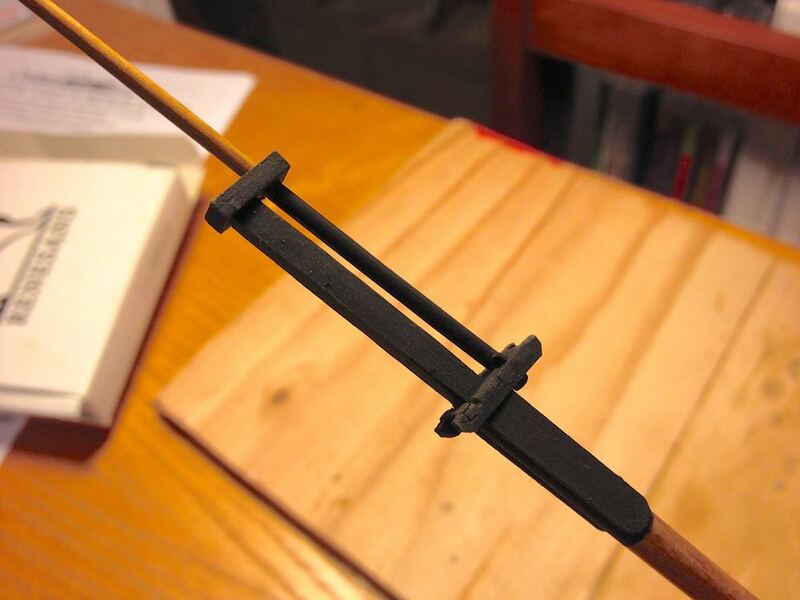 I’ll probably add some kind of handle, either bent wire or a simple block type handle from paper. The completed piece was painted and set into place. I also found an old screen in the garage. It turns out that the mesh is the exact size I need for the mullion pattern for the companion way over the captain’s cabin. I pulled out a bottle of canopy glue, which I bought for another project, but didn’t like the way it worked. For this one and the small glass panes, it worked great – Just squeezed a little out to fill in all the holes in the piece of screen material. Once dried it looked perfect, so I cut down to the exact size I needed and dropped it into place. I also built and cleaned up the deck pumps and decided to give them natural wood looking handles instead of leaving them their printed color, which was red. Being on a roll, I decided to try to make some progress with a rather daunting sub-assembly, the windlass. I say daunting because the windlass barrel alone consisted of 31 REALLY small parts that all had to be cut out and glued together properly. I did manage. However, it required a concerted effort to break the mental barrier of taking on the complicated assembly. Once started, it actually went pretty quickly. There’s still more to do here, but the basic barrel is done. As for what’s next, I try to keep that open. There are still many small assemblies that need to be completed, and there’s not particular order they need to be done in. Also, there is the matter of the cannon barrels. I went ahead and rolled the barrels using the kit patterns. I wanted to see how well they might work. But, I’m considering turning them in brass, or at least turning masters in brass if I decide to cast them. This entry was posted in Card Models, HMS Alert - Card Model Build, Ship Model Build Logs, Ship Modeling News and tagged HMS Alert, Paper Models, Shipyard on April 30, 2015 by catopower. As I mentioned previously, the Alert paper model has been somewhat of a distraction. But, after reaching a bit of burnout from a recent heavy workload, I needed the distraction. I’d actually worked on the model a bit more since my last posting and here’s an update of some of the work that was done. The cap rail went on pretty easily, though cutting the rectangular openings for the timber heads proved to be a challenge. As with most of the parts I worked on, I began by painting to get rid of the white edges. At some point, I’d get a little paint on the printed areas of the part and found it was just pretty much standard practice to paint over those areas too to even out the color. I also installed the catheads, which are built-up from several layers of paper and then covered with the printed paper. Again, these look a lot better after cleaning up, but I was pretty pleased with how they went into place and how sturdy they were. Those timber heads were a real pain to get half-way uniform looking and properly trimmed to shape. I also found it took some work to get them to fit the holes I’d cut into the cap rail and had to do a lot of extra fitting work. Still, when painted, it all looked pretty nice. Not perfect, but nice. Next, I decided to tackle something that seemed like it would be pretty easy, the shot racks. 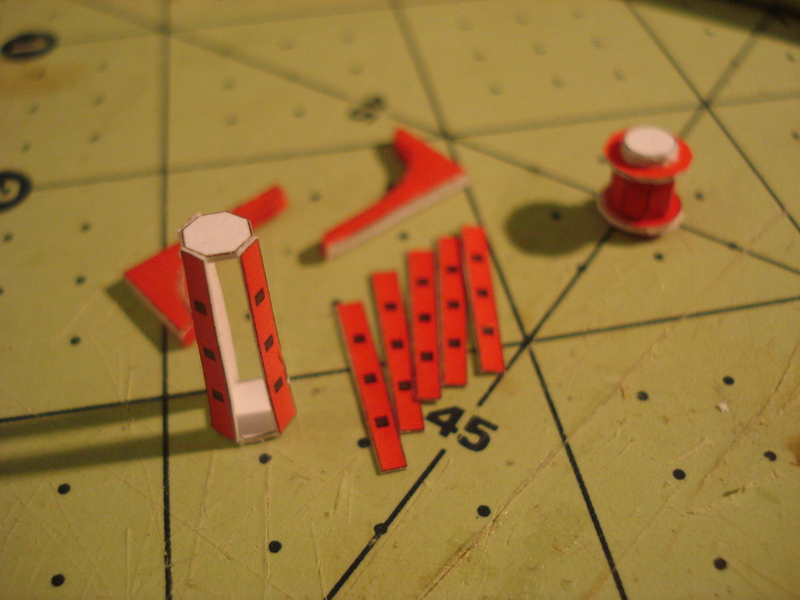 The paper model just gives printed racks with black circles to represent the shot. At this small scale, it’s probably fine to leave it that as it’s hard to tell when you have scale cannon balls in place. Note the one little ball bearing that escaped in the upper part of the picture. Somewhere buried in my carpet are several ball bearings that will NEVER be seen again, ever. The first shot rack installed. It was a bit of a challenge to hold it in place while glueing. I found it easiest for me to use my thumb to hold the part against the bulwarks, then use a pair of hemostats in my free hand to nudge the part until it was perfectly straight, then drop the hemostats for a bottle of thin, fast setting CA. A tiny amount locked the piece in place and it is quite firmly set. Though it’s a blurry photo, you can see that all the shot racks were put into place and then the white edges were painted. It all turned out quite nice. 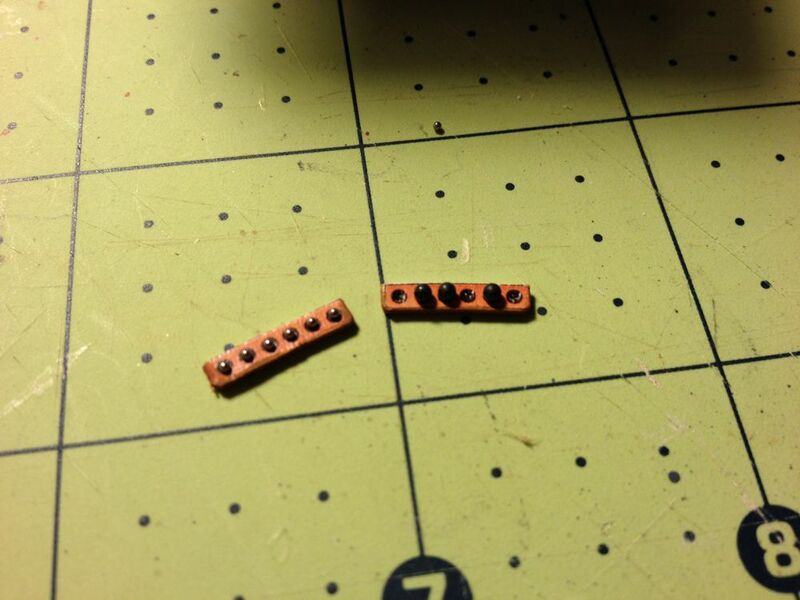 When I would run into more daunting tasks, I’d occasionally assemble some of the parts needed for later assemblies. Here all the parts were assembled and cleaned up and touched up. There are plenty of parts like this that need to be done, so there’s no shortage of small tasks. Things went together quite well, but the long, thin shanks of the anchors are a bit delicate. With the stocks attached, it’s going to be very easy to accidentally twist or buckle them, so I’m saving that assembly for later. 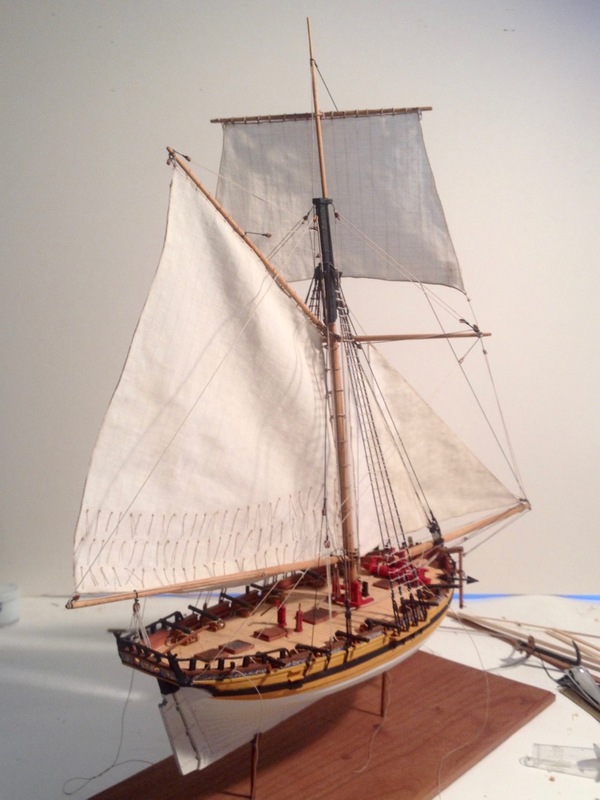 I also played around with making the mast and the cap and crosstrees for the topmast. 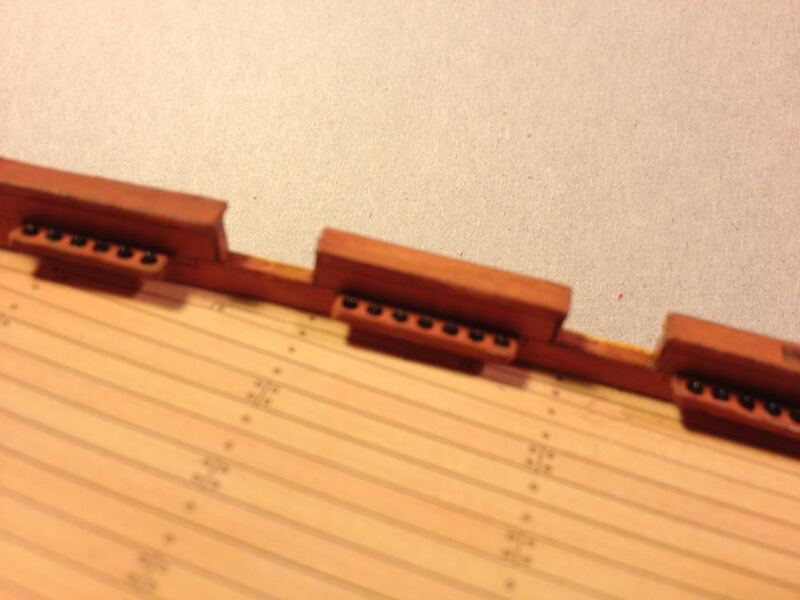 I’d purchased the masting set for this model, which included dowels and laser-cut cardboard pieces for the details. But, I wasn’t particularly happy with the quality of the wood, so I used my own birch dowels, stained with, if I recall correctly now, Minwax Golden Oak stain. I tried using the laser-cut cardboard parts, which were easy to assembly. But, I found that parts built-up from layers of paper were generally sturdier. For the mast cap, the laser-cut parts worked out fine, but I had more problems with the crosstrees. Also, I guess I didn’t get the squared section of the mast doubling small enough, so the crosstrees wouldn’t fit. I didn’t notice this until later in the build, so I had to adjust the work a little and seems okay. 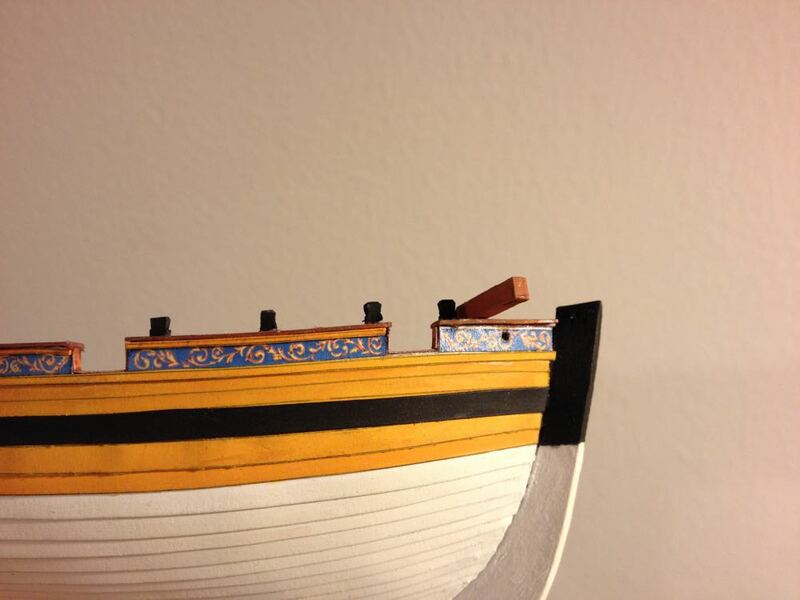 I don’t have any photos of the most recent work, but I added the channels and other small hull details. I also didn’t like the way my original transom planking looked under the counter. I’ve redone the area twice and the last time it seemed to come out well enough for my task. I’ll post more photos of that work next time, along with any new work I complete. This entry was posted in Card Models, HMS Alert - Card Model Build, Ship Model Build Logs, Ship Modeling News and tagged Card Model, HMS Alert, Naval Cutter, Shipyard on April 18, 2015 by catopower. So, now that I’ve given props to the larger boxed edition HMS Alert kit with all its laser cut parts, I’ll say that I’m having a great time with this small 1:96-scale kit. It’s frickin’ neat! 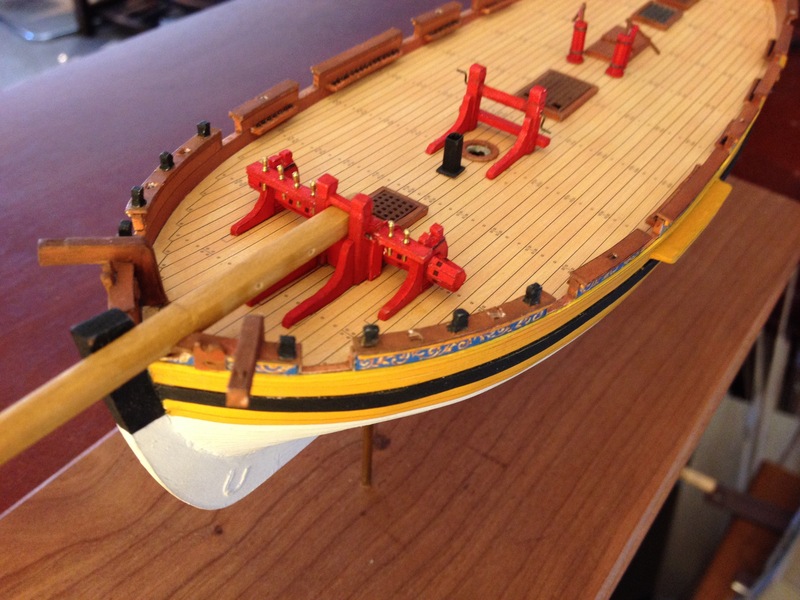 I brought the model as it is now to last month’s meeting of the Hyde Street Pier Model Shipwrights, and I think I’ve got a couple people interested in buying the kit, or at least interested in trying a paper model. 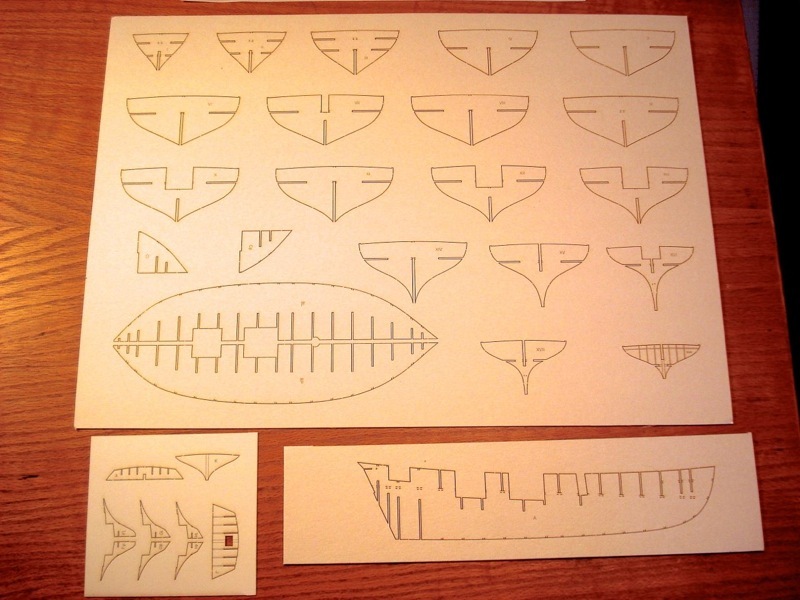 One of them became interested after we had a discussion on how this kit might actually be really useful for a ship modeler looking to scratch build a wooden model of the Alert, which seems to be a very popular subject. I’ve even considered doing this, though for now I have the paper kit. I suppose I should use the term “card model” because I think that’s how most builders refer to these models. I think it does sound a little more sophisticated than calling them paper models. I just use the term “paper model” because that’s what the manufacturer calls them. Probably sounds better in Polish. Anyway, the idea with using the card model for wood ship modeling is that the planks are pre-spiled and nicely printed out. These might actually serve well as patterns for cutting wooden planks. It seems like all you would have to do is blow up the paper parts to 200% and you’d have templates for a nice 1/4″ scale (1:48) wooden model. So, we may experiment with that idea. In the meantime, the lapstrake planking worked out really nicely and goes on very easily. This gives the hull a third layer, with the hull shape getting smoother with each layer. I ended up painting the hull using paints I bought from Shipyard. These paints are interesting because they seem to use a fairly coarse pigment, at least that’s the way it seems to me, though maybe I’m misinterpreting the finish I’m getting. The reason I say this about the pigments is because of the texture of the finish. Not only is it very flat, but it remains that way even after repeated applications. Also, the texture of the dry, painted surface is rough to the touch. The paints are fairly transparent, so you can still see the printed lines in the paper, even after a couple applications. This also means that it takes more coats to cover up problems, but that’s not necessarily a bad thing. I’ve been going to town on this over the past couple weeks. A bit of a distraction from my other projects, but it can’t be helped – this model is too much fun to build. What’s more, I’ve actually been approached by a fellow ship model club member about buying the completed model from me. It really is that neat! This entry was posted in Card Models, HMS Alert - Card Model Build, Product Review, Ship Model Build Logs, Ship Modeling News and tagged Card Model, HMS Alert, Naval Cutter, Paper Models, Shipyard on October 11, 2014 by catopower. Of course, you know that having this kit for a month now, I had to get something done on it – I couldn’t just leave well enough alone and report about the kit and move on. It was just too tempting, so I started tinkering with the model with no solid intentions to finish it. I just wanted to see how it goes together. That may change soon, as I’ve been having a lot of fun with it and learning a lot about card models. But, before I talk about building this model, let me point out again the specifics. This is the 1/96-scale kit from Shipyard’s Paper Model series, and it is different from their more expensive, more complete, and larger 1/72-scale kit from their Laser Cardboard Kit series. 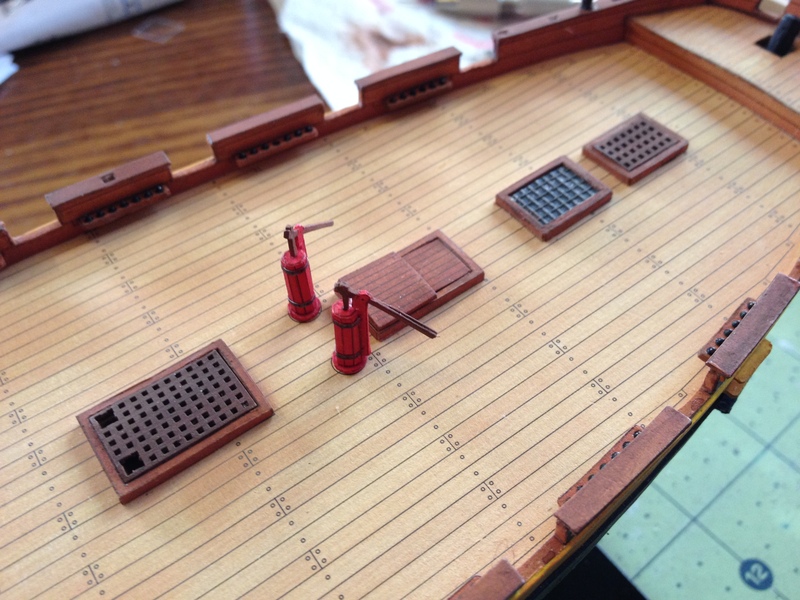 There are two sets of accessories that can be purchased separately for this kit that Shipyard sells (well, aside from blocks and deadeyes), and these are a Sails set and a Masts and Yards set. I went ahead and ordered both of these directly from Shipyard. 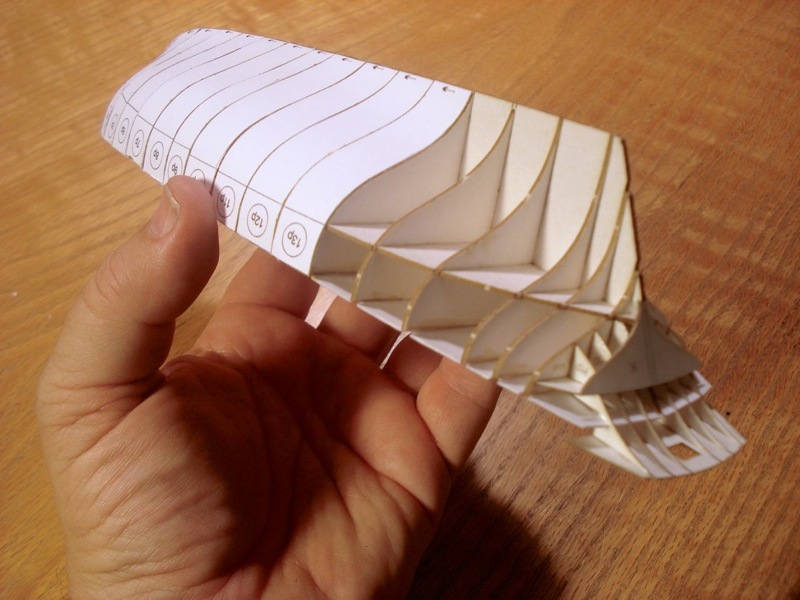 The Sails set includes four laser cut sails, very nicely pre-printed. The cloth is a nice off-white color and the printing is relatively light in color so that it does not overwhelm the eye. The lines of seams give a good scale appearance and a coil of line is included for the bolt ropes. The only downside of the sails is that they are printed on only one side, so the back sides may appear a bit stark unless there is some amount of backlighting so that the printed lines show through a little. 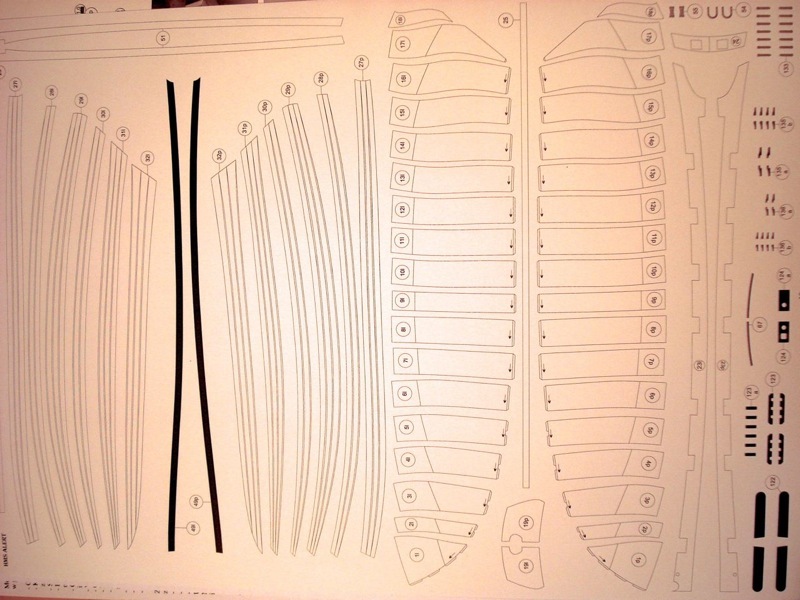 I’m not sure how well it would work out, but I suppose you could always use these lines as a guide for sewing. Something I’m not averse to trying out. While I was at it, I bought the Mast and Yard set too. 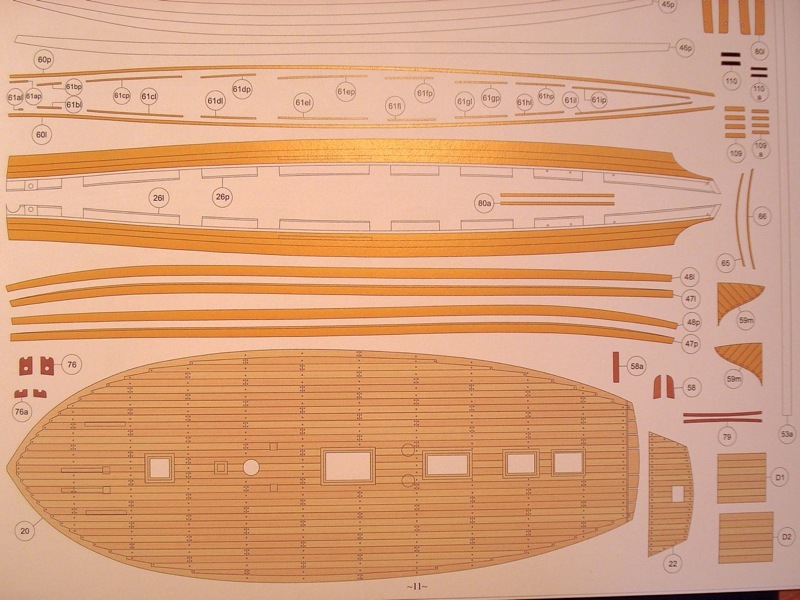 This set includes not only all the spars in wood, but also includes laser cut parts for the cross trees and caps. These are plain paper and must be painted. So, I went ahead and started tinkering with the model, actually almost immediately after my last posting about the kit, but I think I’ll write about that in a different series of posts and leave this as more of a follow-up to my initial kit review. 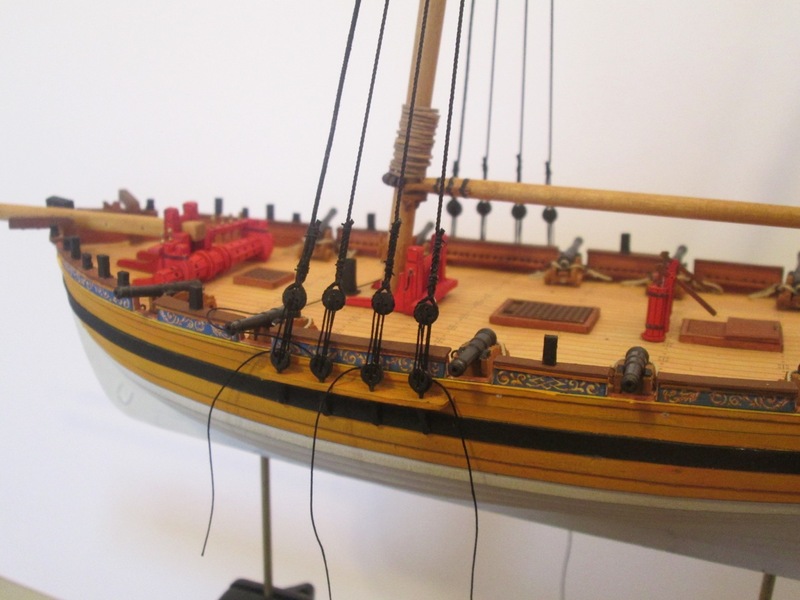 Let me finish this with a plug for Shipyard’s 1:72-scale HMS Alert, 1777, Laser Cardboard Kit. While the kit I have shown here is pretty nice, it is small and inexpensive, the larger kit is REALLY NICE! Unlike my kit, which has a lot of color printed parts that you have to cut out yourself, the 1:72-scale kit has more plain paper parts that are laser cut for you. 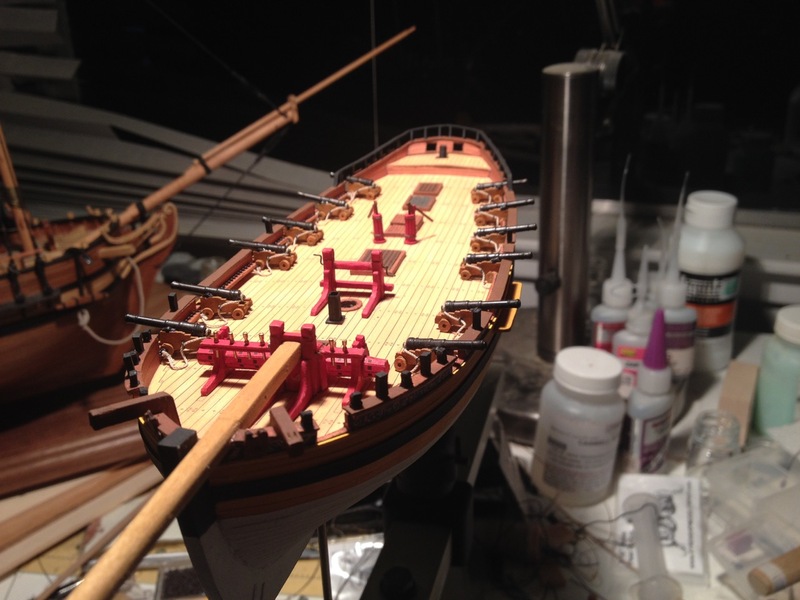 But, it includes the paint and brushes, razor blade, sails, brass cannon barrels, wood dowels for the mast and yards, metal eyebolts, blocks and deadeyes, etc. All in all, it is a VERY complete kit, and at the larger scale looks much easier to build. An absolutely incredible build leaving me wondering how much can be attributed to the larger kit and making me wonder if I’m wasting my time on the smaller kit. I’ll probably press forward with the 1:96-scale kit I have now and see how it goes. By the way, you don’t have to order from Poland to get the kit. 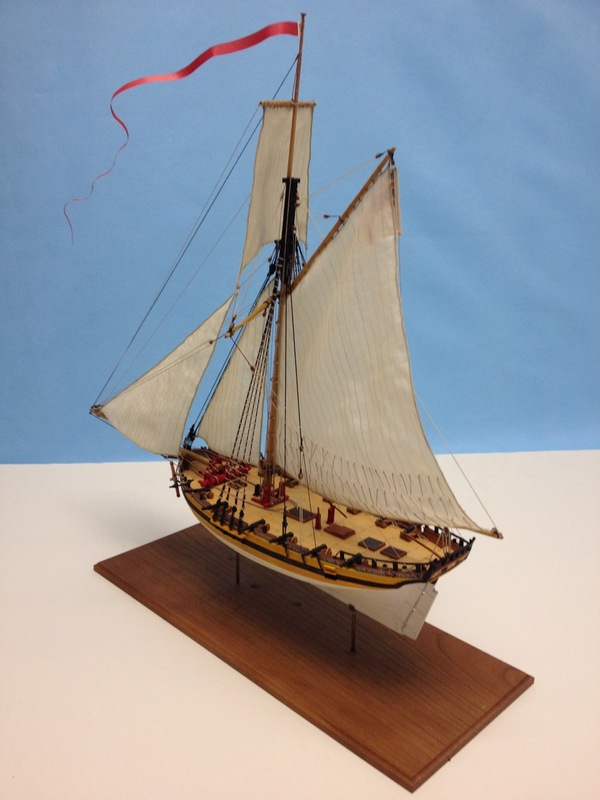 Ages of Sail has just gotten a shipment in from Shipyard – About 5 boxes full of kits. There’s a lot of stuff that came in including a bunch of lighthouse kits. It’s going to take a while to get all of the new products listed, but if your interested, keep an eye out on their website. This entry was posted in Card Models, HMS Alert - Card Model Build, Product Review, Ship Model Build Logs, Ship Modeling News, Vendors and tagged HMS Alert, Paper Models, Ship Model Kit, Shipyard on September 5, 2014 by catopower. Well, some frantic knocking at the door got my attention this warm Saturday afternoon. I could tell it was the Mail Carrier – they’re usually in a hurry and don’t want to have to fill out extra details if they have a package that needs a signature. I had an inkling that this was my Shipyard kit from Poland. So, when I opened the door and saw the blue uniformed man with electronic pad and a flat parcel in-hand, I knew the kit had arrived. Ordering from Poland turned out to be pretty simple and the site provided me with a tracking number that actually worked fine with the Polish postal system as well as USPS. I ordered this item around July 22 and arrived August 2 and cost me a little over $14 via Registered mail. I actually didn’t think it would get here until Monday or Tuesday, but here it is on a Saturday. Six large sheets of printed parts, though one of those contains a copy of the laser-cut parts. For those interested in the ship itself, HMS Alert, 1777, is a small 12-gun Naval Cutter used for coastal patrols to intercept smugglers and pirates, and to protect coastal shipping from privateers during the American War of Independence. 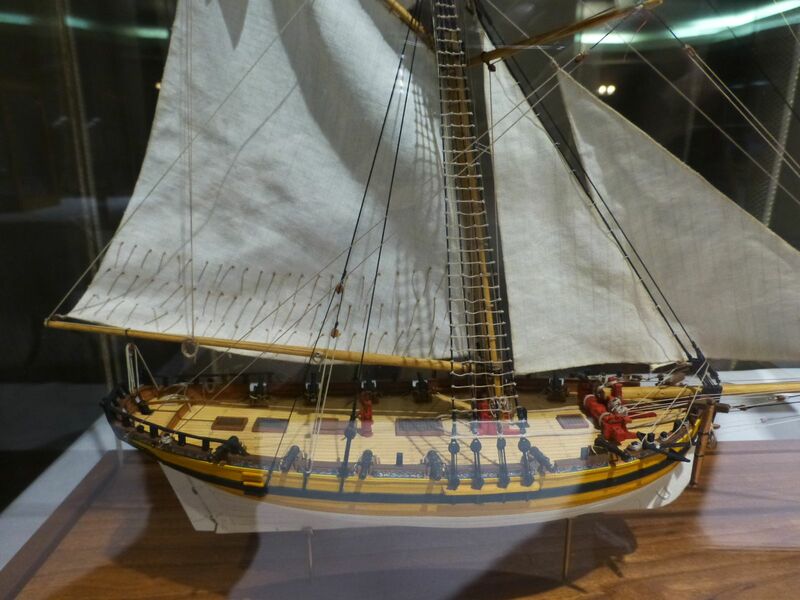 During that war, she managed to capture the larger and more heavily armed American privateer Lexington, and as part of a squadron action against the French frigate La Belle Poule and the lugger Le Coureur, she captured Le Coureur. There is a book in the Anatomy of the Ship series, The Naval Cutter Alert, 1777, by Peter Goodwin. It is out of print and collectors have driven up the price of used copies, but they do appear at relatively reasonable prices from time to time. So, this kit looks like a lot of fun and I may just have to try it out to see how long it takes to build a paper model. 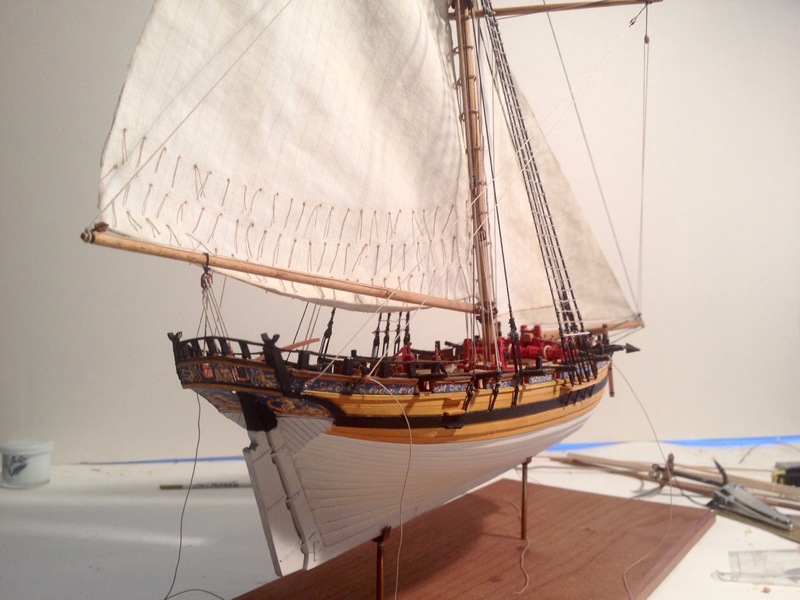 This kit is from Shipyard’s Paper Model series of products and is in 1/96-scale. They also have the Alert available in their Laser Cardboard Kit series, but that one is actually 1/72-scale, so the details should be more complete and more interesting on that model. The boxed edition also includes wooden blocks and deadeyes, brass cannons, paints, brushes and more. It seems like a pretty nice set, but I just didn’t want to pay the extra for all then when Ididn’t even know if I’d like paper models. 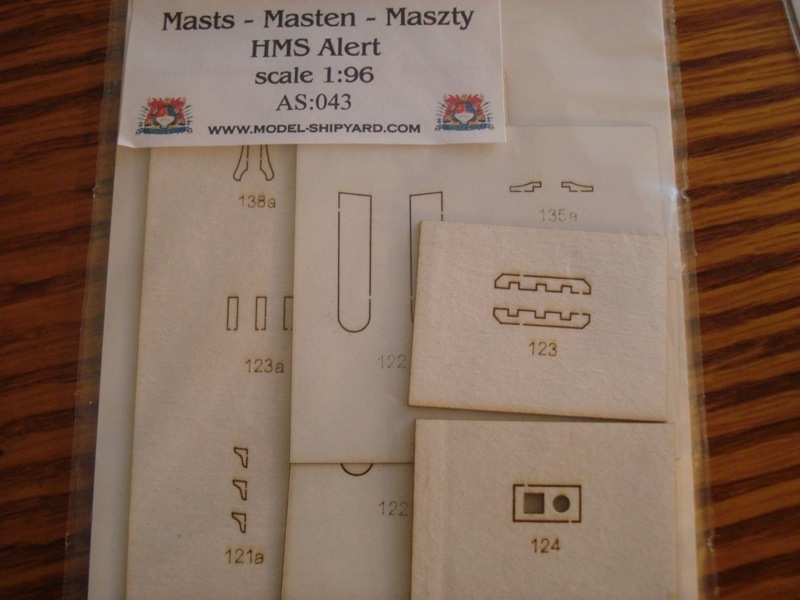 Shipyard also has a masting kit and a sail kit for the Alert available separately, and I can say that I like this model enough to go ahead and spring for those, especially now that I know that shipping from Poland seems to be pretty quick and painless. I’ve already been loading up my shopping cart for the next order. The sail kit and the mast kit together cost about $13. I’m also considering adding to that some of the Shipyard water-based acrylic paints. I’m sure any decent acrylics will work as well, but I figure these are designed to be a close match to their print colors. I guess all of this means that I’m going to squeeze this project in amongst the others. But, this appears to be quick and I’d like the chance to know more about it. 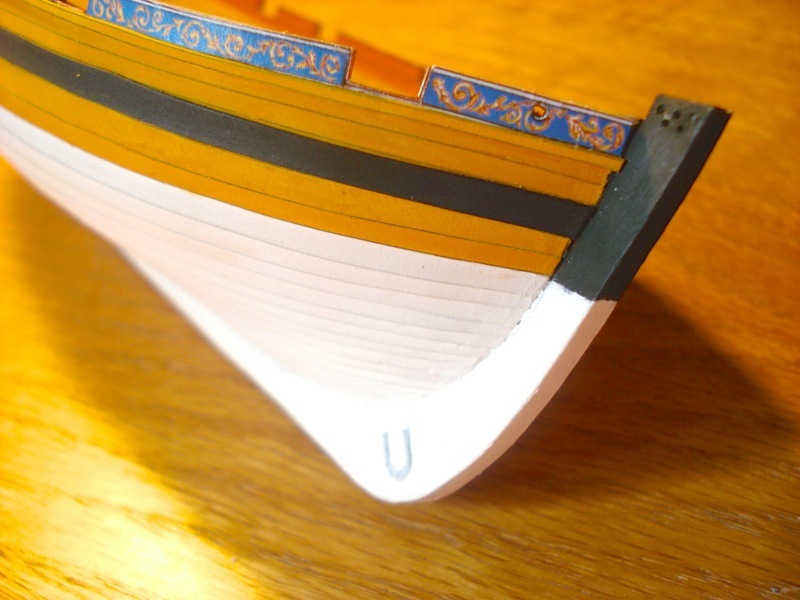 I think there are plenty of people who might really enjoy paper ship modeling as either a break from wooden ship modeling or for its own sake. This entry was posted in Card Models, HMS Alert - Card Model Build, Product Review, Ship Model Build Logs, Ship Modeling News, Vendors and tagged Paper Models, Ship Model Kit, Shipyard on August 2, 2014 by catopower.